California Tourist Guide, your California vacation planning friend! Welcome to the California Tourist Guide — a great place to plan the perfect California vacation, holiday or weekend getaway. Even if you’re still in the California Dreamin’ stage, you’re sure to find some fun ideas to get you going and off to a good start. Have you decided where in California you want to visit? Do you want to check out the northern California tourist attractions in the San Francisco Bay Area and the Napa-Sonoma Wine Country, perhaps? Are you trying to decide which Southern California area would be best for your family vacation? 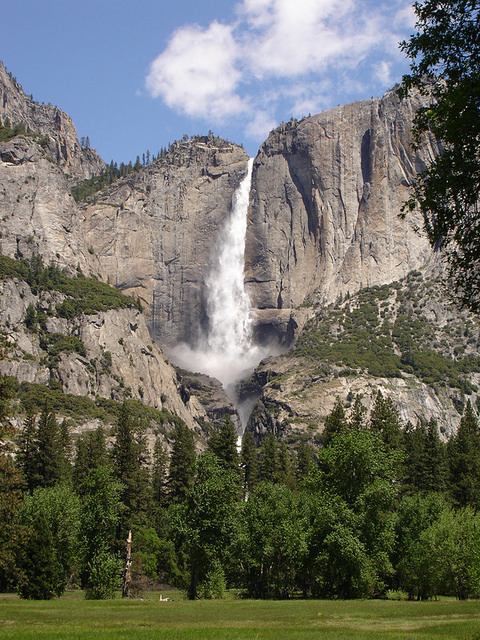 You can find all this and more within our California Tourist Guide articles. 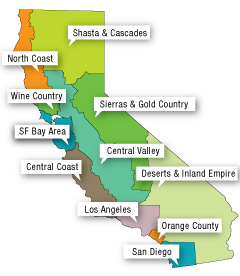 California is a BIG state, and most people have to focus on a particular area or city when they travel here. You could spend several weeks, for example, in Los Angeles alone and still only scratch the surface of all its famous beaches and attractions. If you already know where you’re going, just click on where your destination is located in the state – Northern, Central or Southern – in the top navigation buttons and then drill down to specific areas for trip ideas. If you have a bit more time to explore, the California tourist map above might also help you find other vacation and recreation opportunities that aren’t too far away from your primary destination. If you’d like to request that a free 2016 California vacation information brochure be mailed to you (or to access the state’s digital magazine publication), just click the preceding link for all the details. You’ll also find links to various state-provided free California maps there, including some maps you can access online that share real-time traffic information. We also offer this California cities list – to help you determine the area where some smaller cities are located – and that reference can be very helpful if there are people or perhaps an “off the beaten path” tourist attraction you want to see or include in your California vacation itinerary. It IS a big state, but the California Tourist Guide wants to help you find your way around and get the most bang for your vacation buck. Do California beaches figure prominently in your perfect vacation plan? Just follow that link and you’ll find a complete list of California beaches and beach towns! Just so you know: there’s quite a variety of beaches here. California’s North Coast beaches are a bit rugged and wild compared to the serene and scenic Central Coast beaches, and then there’s the “laid-back cool” of Los Angeles beaches and a “fun in the sun” vibe at the beautiful San Diego beaches. It’s pretty safe to assume that whatever kind of beach you like, California has you covered! Are you a golfer? Each California region offers wonderful courses, so it’s easy to enjoy a California golf vacation, and many people choose to spend some of their time golfing and another chunk of time enjoying other activities. For example, if you’re planning a family vacation, you might combine it with visiting California amusement parks, but if your plan leans more toward R & R – relaxation and romance – you might consider looking for a course where a California spa vacation can be part of the package. We sincerely want you to have the best possible California vacation, and we’re honored to help you plan it. We take our California tourism responsibilities very seriously around here! Maybe you’re looking for an extraordinary outdoor adventure? You could explore Yosemite National Park (in the Sierras and Gold Country area) or majestic Mount Shasta (in the Shasta and Cascades area), but every region has its own natural treasures – even freeway-filled Los Angeles! And, while you’re here, please be sure to sample – even indulge in! – California’s superb food and drink. Maybe you’d enjoy some San Francisco food tours (there are several alternatives) or you might even use a Wine Country cooking vacation as the starting point for your vacation plans. Abundant epicurean delights from both land and sea inspire an incredible array of talented and passionate California chefs and winemakers. In Italy they call this la dolce vita (“the sweet life”); here in California, we call it AWESOME! Wine Country’s Napa and Sonoma are well known and wonderful, of course, but there are several different places in the state to enjoy locally produced, award-winning wine. The Central Coast (Monterey/Carmel, Paso Robles, Santa Barbara and more) and Gold Country wineries are coming on strong, as are the wineries on the North Coast and in the Inland Empire’s Temecula area. If you enjoy wine, check them out! And, truly, you can find FABU California restaurants wherever you’re headed. Choose an area from the top navigation buttons, use the search box below to find something specific or click the following link to peruse the California Tourist Guide statewide articles and to learn more about everything this wonderful state has to offer. 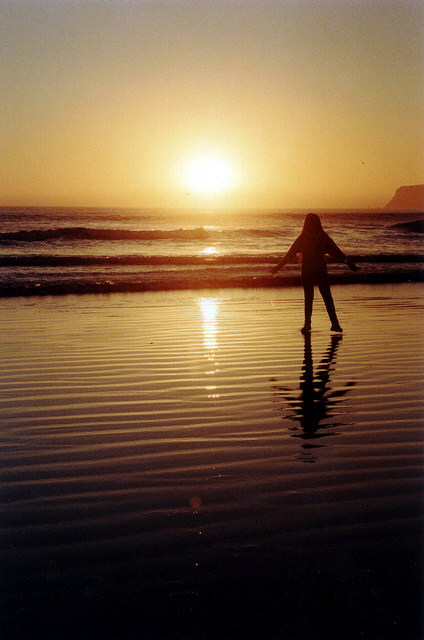 Photo of Coronado Beach in San Diego by Bill Kuffrey (deleted account) via flickr (Creative Commons) and Photo of Yosemite National Park by Brett Holt (deleted account) via flickr (Creative Commons).